I don’t know what’s come over me lately, but I have been on a serious seafood kick. For the first time in my life I have been eating fish 2 or more times a week, and I’ve been craving it like mad. Especially fish tacos. So when Nik and I went to the local farm stand, I exclaimed that I wanted fish. By the way, my mother-in-law calls farmer’s markets “the place where stuff grows from the ground” (which means it’s what we call it now too). At the fish counter, where stuff grows from the sea I guess, we picked up a dozen clammies with no clue what we were going to prepare. This meal was going to go one of three ways: miso soup with clams, zuppe de pesce, or manhattan clam chowder (Nik is lactose intolerant). As always, things didn’t go as planned. Not enough clams for a proper chowder (if you can ever call manhattan clam chowder “proper”), no other fish for the zuppe, and no tofu for the miso soup. The only downside of our final dish was no good bread for dipping. Crap. Serves 4, should cook in about 15-20 minutes tops. Figure out how to cook the pasta, that’s baby stuff by now Holmes. By the way, Nik is a good sport, this isn’t her favorite meal — but you watch, I’ll turn her one of these days! Looks mighty good! 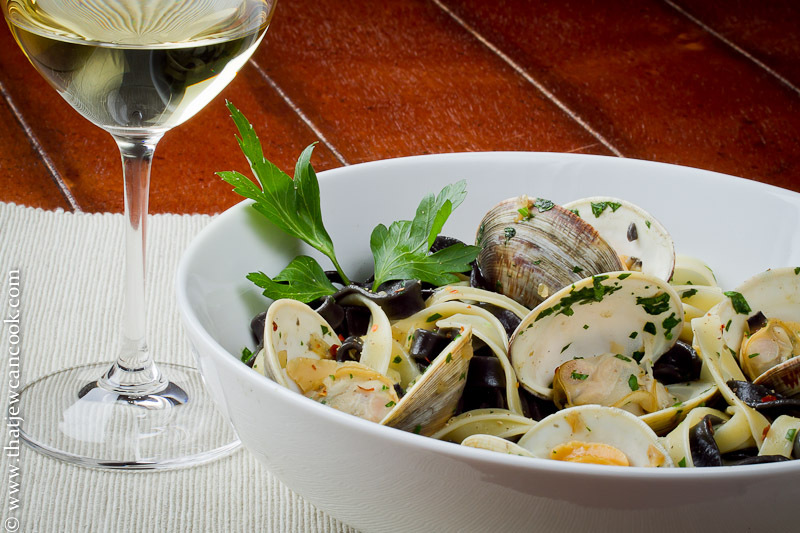 I need to hunt for some clams now, as I have not treated myself to this dish in ages! Weirdly, I did not get notification of this post in my mail box as usual. Well, I am behind, so I may have – but I try to get to yours first now. It is my goal – as the recipes are so YUMMY! I can never get enough shell fish. And, you can get fresh clams out there – but, this isn’t the season – is it?? No matter. I would eat this dish any time of the year. Preferably at your house!!! I never get your posts in my mail, I wonder why as I subscribed a long time ago? Why do you put the cornmeal in the clams? Their last supper? Bwahaha!!! seriously though…. Well done, lad. By the way, I love your mom’s saying, cracked me right up! The Shiksa does have an issue with buttah, but she’ll eat it anyway…she can do OK in small quantities. I just wish she liked the vongole more! Now how did I miss a chance to use the word vongole in my entire post? I love that word. Maybe I can one day name a boat the S.S. Vongole (a man can dream)…. PS: Take a look at my tuna post and give it a shot, you’ll think you’re eating steak!